As a parent you may be unaware of the importance of early detection of vision problems in your child and what you can do to assist her visual development early in life. More than 98% of infants are born with normal, healthy eyes. However, the normal structure and health of the eyes do not guarantee that your child will be able to use those eyes efficiently. Although clear eyesight is important in your child’s visual development, it is not the end result of good vision. “Sight” is being able to see. “Vision” is the ability to understand what is seen, to detect where it is, and to react to it (reach for an object, duck when a ball comes near your head, read a book). You can help your young child develop her vision skills even before she begins to read or attend school. An infant actually craves visual stimulation and the variety you offer her is important to her development. Elaborate toys are not necessary—the world itself is a very stimulating place. Remember, it’s all very new to your curious child. From infancy, your child’s day is filled with lessons in spatial relationships and as she develops, looks at, feels, tastes, pushes, pulls, throws and drops everything possible as she learns three-dimensional characteristics and functions. You can help your child by moving her from room to room, by different lighting conditions (not extremes) and by approaching her from different directions. If you speak as you move about, she will learn to follow the sounds of your voice with her ears and look for you. A brightly colored mobile above her crib helps to develop depth perception. Different shaped blocks and rattles help your baby learn to reach and grasp. Pots and pans, measuring spoons and containers that fit within one another are all fun toys and great visual lessons for your child. 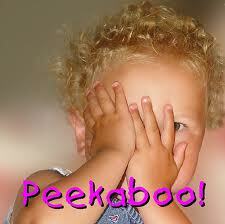 Even playing peek-a-boo, as fun as it is for both of you, strengthens her visual develop. These early eye-guided movements of the hand are the “dress rehearsals” for learning to read later on. Because your child has no way of recognizing good vision, she depends on your observations and awareness for detection and correction of problems. A complete “Parents’ Guide and Checklist” is available - just contact me.